Disk manufacturers who also make NASes have a price advantage over manufacturers of BYOD products. This is certainly the case for the recently updated My Cloud Mirror Gen 2. The My Cloud Mirror Gen 2 is very similar to the more business-oriented My Cloud EX2 we reviewed in March of 2014. The new Gen 2 has a different processor, a white case and the SOHO My Cloud feature set. Our review unit was the $310 4 TB model. However, the Gen 2 also is available in a $370 6 TB version (2 X 3 TB) and a $410 8 TB version (2 X 4 TB). Each of the models arrives preconfigured for RAID 1 (mirrored), so your actual available fault-tolerant storage will be half the stated capacity. Priced at $310 with two 2 TB drives included, the Gen 2 is cheaper than quite a few BYOD 2 bay NASes. I'll be using the Seagate NAS Pro 2-Bay and NETGEAR ReadyNAS RN202 for comparison throughout the review. The Seagate NAS Pro 2 bay, like the Gen 2, includes two 2 TB drives in its $340 price. For a BYOD NAS, I chose the NETGEAR ReadyNAS RN202 because, priced at $250, it was the cheapest BYOD NAS that also had a better Total NAS score than the Gen 2. If you add the cost of two WD RED 2 TB drives at ~ $95 each, the total cost for the RN202 with an equivalent amount of storage rises to $440. The callouts below were taken from the user manual. While WD has a support section with downloads for the Gen 2, the user manual isn't one of the available downloads. We found a link for the manual in the help section of the Gen 2's user interface. The front panel is very simple - there's just a single power/status LED and a LED for each drive. A combination of red, blue or not lit coupled with various blinking patterns tells you what you need to know. The image below shows the rear panel callouts and LED indicators. The single Gigabit Ethernet port has two status LEDs - one for link speed and one for activity. There is a pin reset, a Kensington security slot and two USB 3.0 ports. There's a small, very quiet fan positioned at the front bottom of the case that moves air across the drives and board. The Gen 2 was rated as very quiet and drew 14 W active and 6 W on standby with the two WD Red 2 TB drives spun down.. The image below shows the main board with the heatsink in place. This image below shows the board with the heatsink removed to expose the processor. This is a completely new board, not the same as the WD My Cloud EX2's. Table 1 below shows the key components for the comparison two bay NASes. The My Cloud Mirror Gen 2 arrives preconfigured for RAID 1. There is no possibility for RAID Expansion. Changing to RAID 0 or JBOD completely deletes all data from the drives. WD recently changed the My Cloud UI from gray and charcoal to soft blues. The original My Cloud Personal Cloud single drive NAS has also been upgraded with the new UI, but has fewer options than the My Cloud Mirror Gen 2. Additional features on the Gen 2 are found under the Backups (allows for backups to attached USB storage devices), Storage, and Apps tabs. The Storage tab allows for reconfiguration of the physical disks. Apps allow you to install applications that run on the NAS that add additional features. The image below shows the landing page that appears when you first log in. The screenshot below shows the additional apps that can be downloaded and run on the My Cloud Mirror Gen 2. I've included a short gallery of screenshots that will give you a better feel for the WD My Cloud Mirror Gen 2's UI. View and manage folders and files via web browser. Create a backup job to attached USB Storage. Scheduling is not supported. Enable email notifications. Logging is not supported. Update firmware and schedule Auto Update. Changing RAID mode deletes all data. The factory installed firmware version 2.10.310 was used to run performance tests using the Revision 5 NAS test process. All tests were run using the factory-installed Western Digital Red 2 TB (WD20EFRX) drives. The composite image below shows File Copy Write and File Copy Read performance for two drive NASes tested with the Revision 5 test process. The My Cloud Mirror Gen 2 turned in virtually identical scores on both the Write and Read tests, but both were somewhat lower than the top-ranked products showing ~ 110 MBps. Note that quite a few NASes in both charts cluster between 109 and 110 MB/s. That's about the maximum throughput that you can achieve with single client Gigabit Ethernet testing. As noted in other reviews, performance values within 5% are treated equally when calculating ranking. What's important here is the Gen 2 is in the top tier, well above 100 MB/s. As noted in the introduction, I chose the Seagate NAS Pro 2-Bay and NETGEAR ReadyNAS RN202 for comparison. File copy write and read performance was above 100MB/s for both RAID0 and RAID1 for all products with two exceptions: the Gen 2 turned relatively poor RAID 1 File Copy Write performance of 88.3 MB/s. Similarly, the Seagate had relatively low RAID 1 File Copy Read performance of 94.1 MB/s. We did not observe a similar NASPT File Copy to NAS (write) low performance for RAID 1. The Gen 2 turned in 100 MB/s on that test but was still lower than the other two NASes on the same test. The WD My Cloud Mirror Gen 2 lacks an eSATA port and USB 2.0 ports, so those attached backup tests could not be run. The Gen 2 outperformed the other two NASes on the USB 3.0 FAT and EXT3 format backup tests. The ReadyNAS RN202 grabbed bragging rights for the USB 3.0 NTFS test at 111.6 MB/s. The Gen 2 does not support iSCSI or Rsync, so those tests couldn't be run. The NAS Ranker, filtered for RAID1 and Revision 5 testing shows that the My Cloud Mirror Gen 2 ranked #9. Looking at the chart, you can see there are three other NASes that are cheaper than the My Cloud Mirror Gen 2, but all of them are diskless BYOD NASes. The chart below shows the individual and category scores for the same three NASes used throughout this review. The WD My Cloud Mirror Gen 2 earned a #1 ranking for Video. Its write benchmarks were dragged down by a relatively low RAID 1 Windows File Copy Write score as well as NASPT Directory Copy to NAS scores (also write related) for both RAID levels. For the Read Benchmark category, the Gen 2 did quite a bit better than the Seagate NAS Pro 2-Bay, but still trailed the ReadyNAS 202 in all categories except for Video. 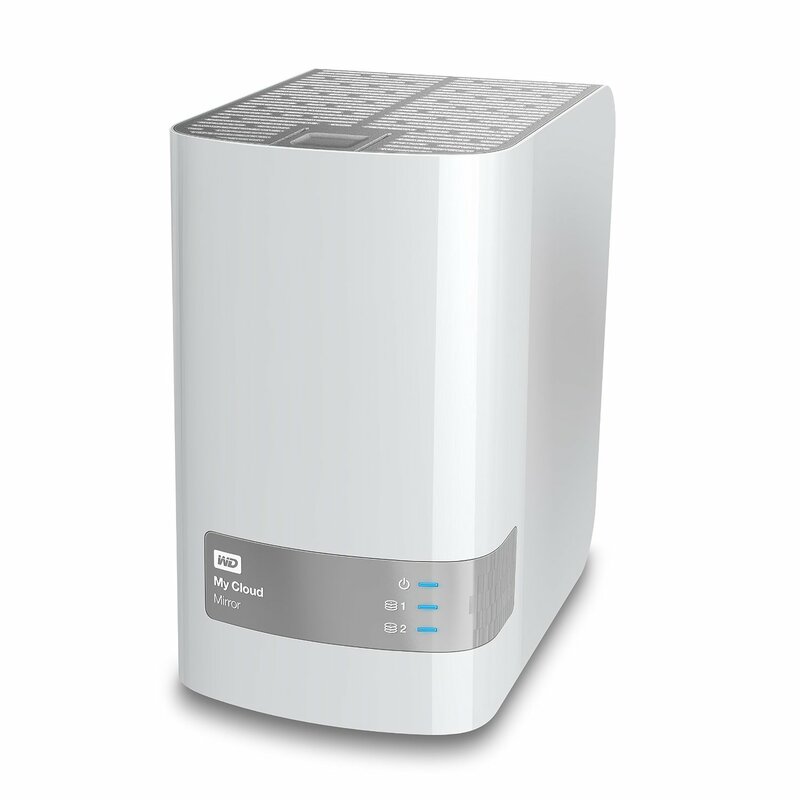 The WD My Cloud Mirror Gen 2 offers a good blend of performance, features and value for the typical SOHO user. It has decent performance, simple remote access with mobile apps for iOS and Android, a good blend of features including DLNA and iTunes servers and the capability to add apps for more features. The Seagate NAS Pro 2-bay also offers similar, but slightly lower performance, but is currently $30 more expensive than the My Cloud Mirror Gen 2. If you want to move up to better performance, your least expensive option is the ReadyNAS RN202 for $250 plus two $95 WD Red 2TB drives. But look carefully at individual tests scores that may be important to you. You might be paying $130 more for something that really doesn't provide a noticeable bump in performance. For now, the WD My Cloud Mirror Gen 2 offers the best overall storage value for a two bay NAS.